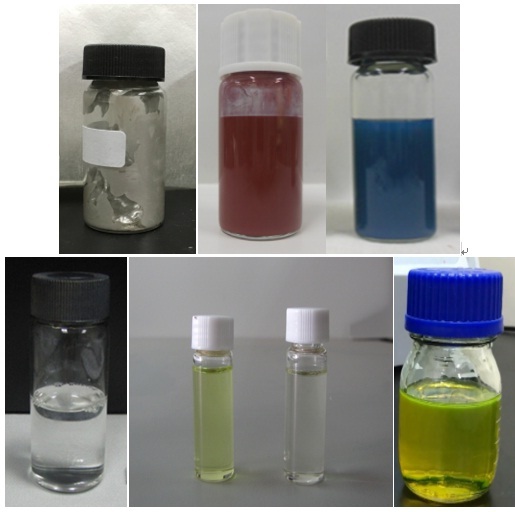 The electronic inks PERC has developed since its establishment include conductor, semiconductor, dielectrics and charge transport materials for organic light emitting diode (OLED). These inks can be printed by inkjet printer or screen printer for printed electronic devices. 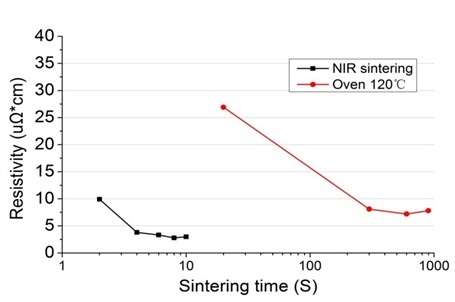 In the meantime, sintering techniques have also been investigated for each of the inks, in particular the photonic sintering based near infrared and UV flash light, which can shorten the sintering process significantly. 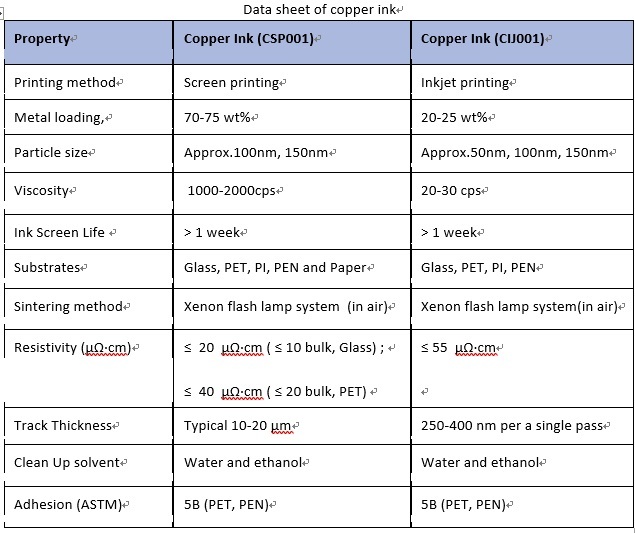 Among the electronic inks, high purity (＞99%) semiconducting carbon nanotube ink and copper ink have reached stable performance (see Tables below) and small batch production capability for external users. In order to enable printable OLED, PERC has developed a number of thermally cross-linkable materials for solution processing of electron and hole transport layers, and made OLED devices by inkjet printing and spin-coating deposition processes. It has been proved that these materials can effectively resist erosion and intermixing of common solvents once they are cross-linked. The solution processed multilayer OLED devices have similar or better performance compared to vacuum deposited devices. To explore the feasibility of all printed OLED, technology for inkjet printing of OLED electrodes have been developed. By optimizing the silver nanoparticle ink and inkjet printing process, electrode matrix for driving OLED has been made by inkjet printing. 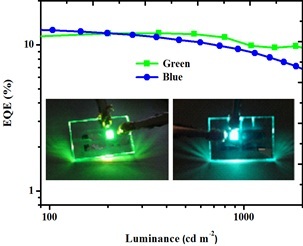 Based on the home developed cross-linkable hole transport material (SDTF) and electroluminescent quantum dots, both of which are in solution forms, QLED devices have been made by inkjet printing. The performance of printed QLED is better than using similar commercial materials. 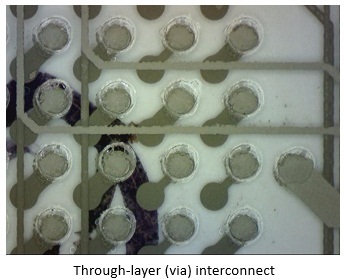 PERC has developed proprietary barrier layer deposition technique for thin-film encapsulation of OLED. 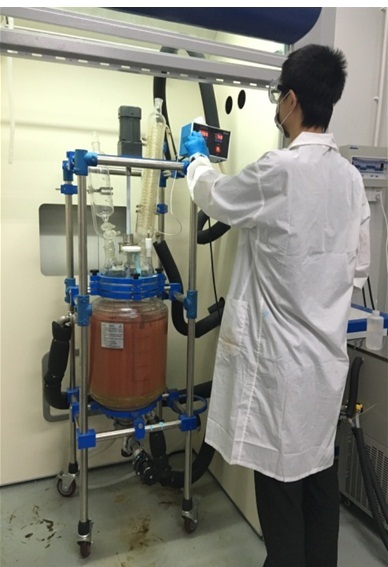 The technique is based on low temperature PECVD process and deposit alternating organic/inorganic layers in the same process chamber without taking out the samples. WVTR of ～10-5 g/m2/day has been achieved. Transistors are the core elements of electronics. PERC’s team has been working on printable thin-film transistor technology since its establishment in 2010. Over the years, PERC’s efforts have been mainly on inorganic printable materials and its application in printed thin-film transistors. 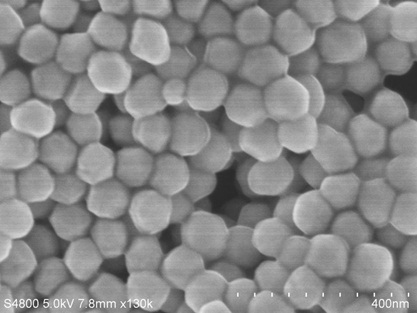 The semiconductor inks that have been developed at PERC are carbon nanotubes andmetal oxides. In comparison with a range of semiconductor materials, carbon nanotubes are the most suitable materials for printing transistors not only because they can be made in solution form but also they are of excellent electronic properties, as the Table shown below. 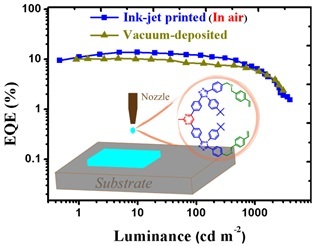 PERC has developed highly efficient purification technique to sort out semiconducting carbon nanotubes and make printable inks, as indicated in the electronic ink section of this web site. PERC also developed a simple technique to selectively convert p-type transistors to n-type transistors by inkjet printing functional inks. Various circuits have been demonstrated including inverters, ring oscillators, logic gates and OLED driving backplane. More than 20 scientific papers have been published in journals such as AFM, JMS, Nanoscale, JPCC, Carbon and ACS Appl. Mater. Interfaces. 13 patents have been filed and 3 have been granted. Metal oxides are another category of inorganic semiconductor materials that are suitable to make inks and to print thin-film transistors, as indicated in the Table below. PERC also developed metal oxide based semiconductor inks and made thin-film transistors by inkjet printing. By modifying the surface property of substrate, high density metal oxide transistor array has been successfully realized. By fast pre-heating process, the mobility of printed metal oxide transistors is substantially improved. Printed IGZO transistors have successfully lighted up OLED pixel array, paving the way to construct backplane driving circuit for active matrix OLED display. 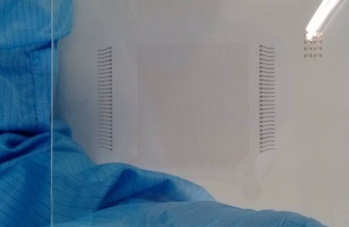 PERC has developed printable conductive paste based on silver nanowires, which can be printed onto elastic substrates such as PDMS using screen printer or by vacuum filtration technique. 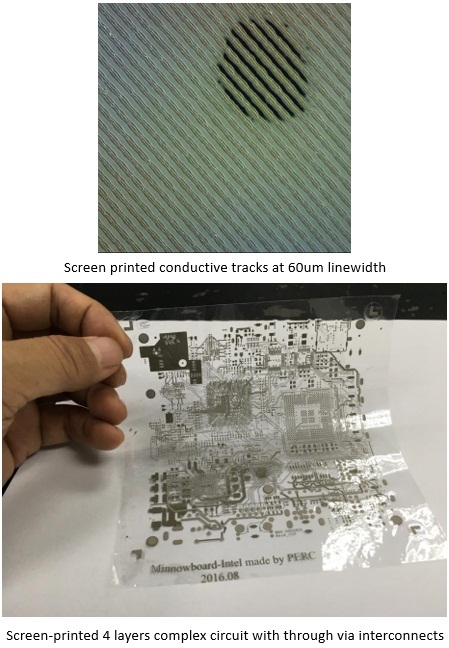 The printed conductive tracks can be stretched without breaking up. 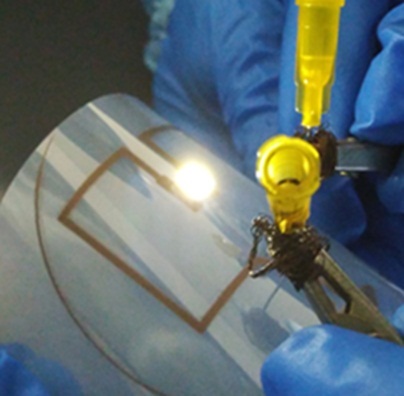 Stretchable electronic circuits have been made with minimum feature size of 50um. The initial stretching of printed conductive tracks will have linear increase in electric resistance. Once relaxed back to its original shape, microscale wrinkles are formed and subsequent stretching will have the resistance stabilized. 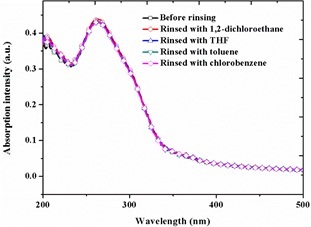 Alternatively, the linear change of electric resistance with stretching can be generated by not forming the microscale wrinkles, which can be utilized as a strain gauge sensor element. Rigid electronic components have been integrated with printed stretchable circuit using PDMS of different modulus for encapsulation. The encapsulated elements will not come off the circuit under stretching condition. 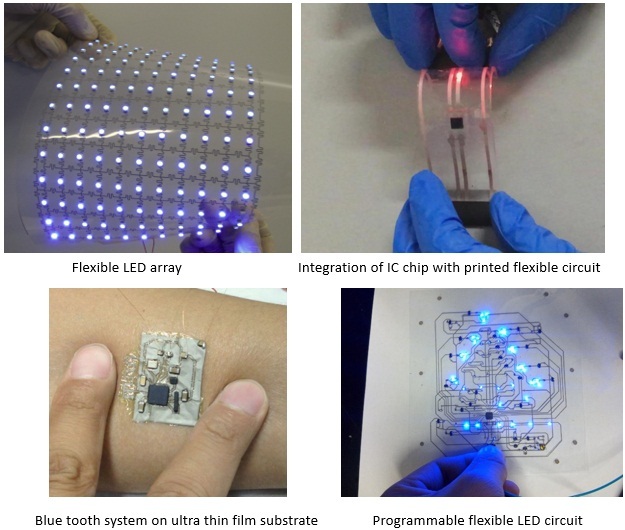 Using the technique, various stretchable circuits integrating LEDs have been demonstrated. Printed electronics also enables the construction of smart textiles. By printing conductive paste onto textile and integrating with conventional electronic components, wearable electronic system can be made. The printing process is easy to implement and of large area and low cost advantages. PERC has setup a printed flexible intelligent system laboratory where a wide range of equipments have been installed to make flexible printed circuit board (FPCB) using additive printing instead of subtractive etching. By integrating commercial off the shelf (COTS) electronic components onto printed flexible interconnects, fully functional flexible electronic systems have been fabricated. The distinctive advantages of printed electronics are large area, flexible and low cost because the systems can be made in batch process by printing. PERC has the capability of printing conductive tracks on large area flexible substrate and surface mounting COTS components. A new hybrid printing technology has been invented, which combines imprinting with conductive paste filling to create embedded conductive lines. The distinctive advantage of this process is that the embedded metal lines can be highly conductive with increasing the line width because of its high aspect ratio. Metal mesh has been made with the technology, which is both highly conductive and highly transparent. The metal mesh film can replace the conventional transparent conductive films based on sputter coated ITO films. At the same transparency, the embedded metal mesh transparent conductive film has much higher conductivity and much better flexibility. The other advantage of hybrid printing metal mesh technology is its roll-to-roll printability. The technology has been transferred to the O-film Technology Crop., the leading manufacturer of touch panels, Roll-to-toll manufacturing process has been developed at O-film. High volume manufacturing of embedded metal mesh transparent conductive films has been realized. The touch panels integrated with metal mesh transparent electrodes have been commercialized. Because the hybrid printing technology can create metal lines with high aspect ratio, much higher sheet conductivity can be realized without increasing the line width, hence, lowering the transparency. The lowest sheet resistance achieved for the metal mesh transparent conductive film is 0.03ohm per square, while still maintaining 85% of transparency, which is believed to be the world lowest sheet resistance for a transparent conductive film. In addition, the surface roughness of metal mesh transparent conductive film can be polished to less than 0.2nm, offering potential applications in optoelectronic devices such as OLED and OPV.